This past Thursday cubes and I went to Bi-Rite Market to pick up a few things for dinner. We also decided to do our regular grocery shopping as well. One of the items we needed were eggs. As I was standing in front of the case, I noticed a chart of all the eggs Bi-Rite sells. I don't know how long the chart has been there, but this was the first time I'd seen it. (I should have taken a photo of it, but I wasn't thinking.) The chart included all of the features by which I shop for eggs (free range, hormone-free, etc.). They also identified how the hens were treated; it was the treatment of hens that changed my shopping behavior. 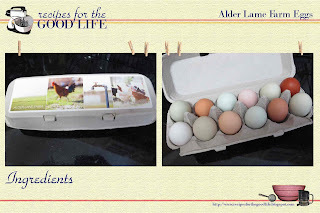 Instead of reaching for the eggs I typically get, I chose the Alder Lane Farm eggs. 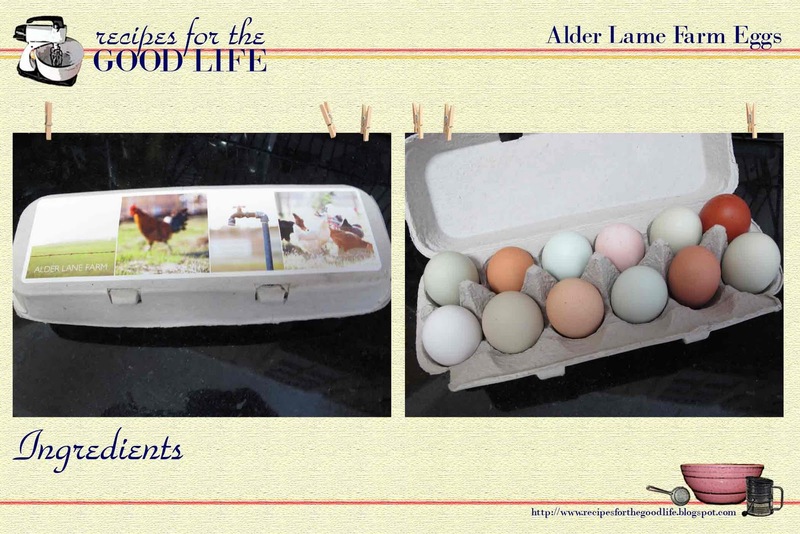 A dozen Alder Lane Farm eggs. It wasn't until Saturday when I decided to make a scramble for breakfast that I got to use the eggs we'd purchased. I gave our fridge a once over and grabbed ingredients. I really like basil and tomatoes in my scrambles, but I didn't have Italian basil. 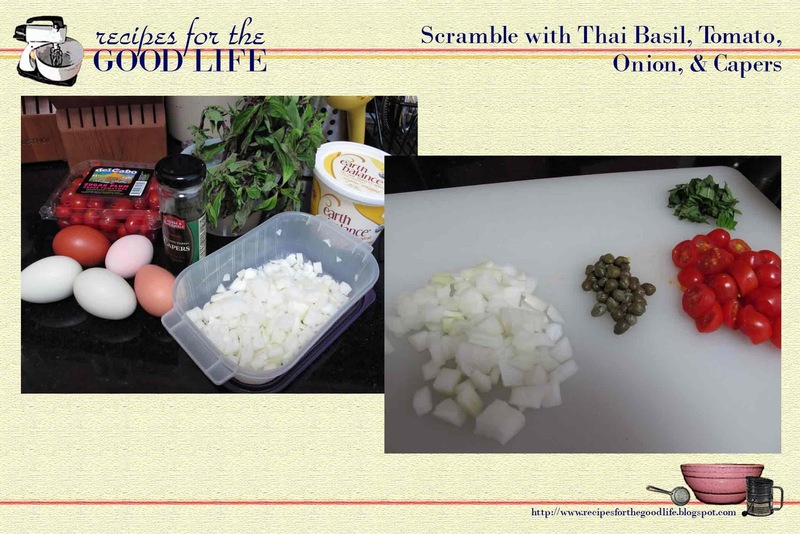 I did have Thai basil which as a slight licorice taste. 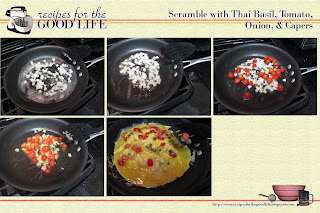 I tried a couple of bites of Thai basil, tomato, and caper until I had a balance of flavors I was happy with. I liked the scramble so much that I made it again on Sunday morning. I'm always searching for new ingredients to try in my scrambles. 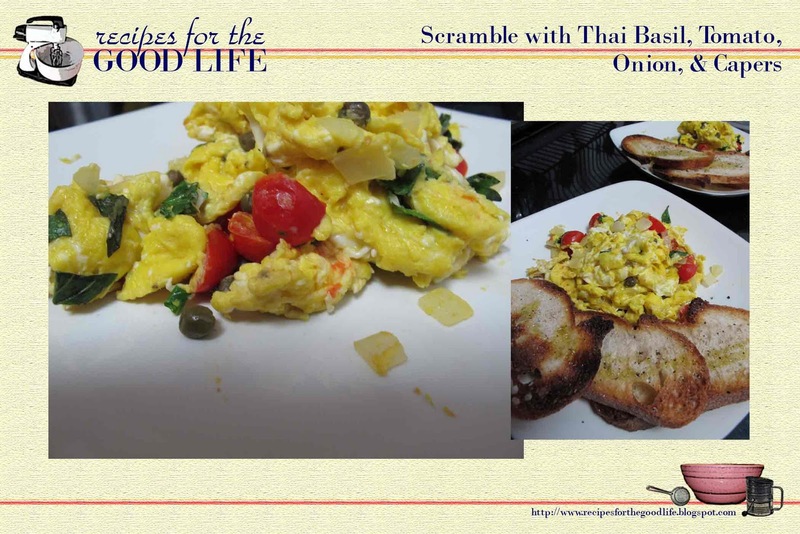 What do you like in your scrambles?